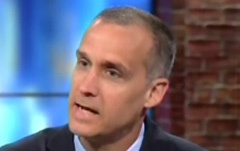 CNN political commentator and former Donald Trump campaign manager Corey Lewandowski “was paid $20,000 in August” by the Republican presidential nominee's campaign for “‘strategy consulting,’” according to The Washington Post. The payment escalates CNN’s unprecedented conflict of interest in which Lewandowski is on the payroll of both CNN and the campaign, and it raises questions about the extent of Lewandowski’s role in the Trump campaign. Lewandowski, who was hired by CNN as a political commentator in June, is still currently receiving severance from the campaign. Lewandowski’s firm was also paid a “regular $20,000 monthly fee” for “advice” in July by the Trump campaign. The ethical morass that has accompanied Lewandowski’s appearances on CNN given that he still advising, traveling with, and drawing payment from Trump has drawn sustained outcry from journalists and media ethicists. CNN President Jeff Zucker recently defended Lewandowski’s hiring and admitted that he was aware that the former campaign manager continued to receive severance payments from the campaign at the time of his hiring. CNN commentator and former Donald Trump campaign manager Corey Lewandowski was paid $20,000 in August by the campaign for what it described as “strategy consulting,” raising anew the conflict of interest issue that has dogged the cable network’s hiring of Lewandowski. CNN has said previously that Trump’s payments to Lewandowski and his consulting firm were “severance” for his employment by Trump. It began introducing his appearances on the air last month by mentioning that he receives severance from Trump. But the payments continued in August, according to Trump’s campaign expenditure filing released Tuesday night. The description used by Trump’s campaign in the filing — “strategy consulting” — also suggested that Lewandowski is playing a more active and current role in the campaign than “severance” would suggest. If so, it would put CNN in the position of employing a person who is also compensated by the campaign and the candidate he comments on — a conflict that most journalistic organizations prohibit. Representatives of CNN and Trump’s campaign did not respond to requests for comment early Wednesday. Lewandowski has apparently maintained close ties with the campaign despite being fired by Trump and escorted from Trump Tower by security officers in June. Various news reports have described him as an “informal” adviser to the campaign. CNN chairman Jeff Zucker has repeatedly defended the hiring of Lewandowski, most recently at an employee town hall meeting on Tuesday, according to the Huffington Post. Zucker has said the network needed to add pro-Trump voices to balance the stable of commentators who support Hillary Clinton and that Lewandowski brought inside knowledge of Trump’s campaign. For information on Media Matters’ petition for CNN to cut ties with Lewandowski, please click here.